HAVE YOU READ “”BETWEEN THE SHEETS””?? YUMMY OHH SOO YUMMY BY LIV RANCOURT!!! I rec’d and ARC from the author in exchange for an honest opinion of her book. This is Miss Mousey’s very honest opinion of “BETWEEN THE SHEETS”. Upon opening an start reading this very tantalizing story from Ms Rancourt. You find yourself pulled into the world of a school teacher who basically has no life other than her teaching. She was to have gotten married but the man she was to have married left her at the alter. Bad bad move on his part. Now all she does – pour herself into her work-no social life. The way in which she brings pen to paper with her creativity is truly remarkable. Her characters are so real life an believable. They live out actual scenes in everyday life. The storyline is a remarkable one and a believable one at that. Could you imagine your self at a convention with a group of your peers and the only way to stay out of the hunt is to take yourself off limits.Thats exactly what this one hot teacher has done. He made a bargain with Maggie that as long as they were at the conference they were a couple. Maggie agreed to it. Thats what this story is about- what happens between the sheets/ What actually happens between Randy and Maggie during that weekend at the conference. Makes you wonder or does it?? This is a beautiful and romantic love story that was written beautifully. You can see these two people slowly finding there way too each other. The cover of this amazing book is fits it Perfectly an is totally awesome!! 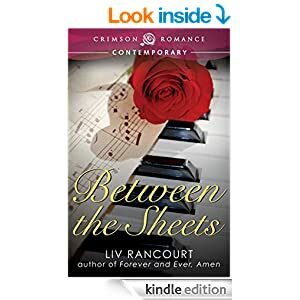 Between the Sheets is written for adults or for those over 18 and love a good romance. Mis Mousey gives it a 45 out of 5 stars. NOW WHAT ARE YOU WAITING FOR RUN AND GET YOUR COPY TODAY !!! ← SHHHHHHHHHHHHHHHH!!!!! CAN YOU KEEP A SECRETE??? ?